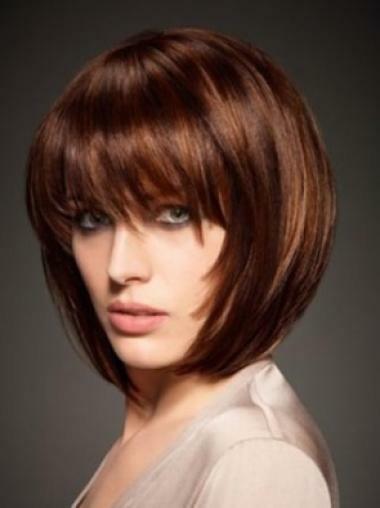 The short bob wig has higher hair density and it has eye-length full fringe with face framing temple pieces. The wig is easy to wear and super easy to style. The hair is made of 100% remy human hair which allows you to perm, dye or style it anyway. Service excellentI get so many compliments when I wear this wig. The color options are great so I can't wait to order it in another color! The service, excellent!! !Thank you. I love the color blackI have had so many compliments for wearing this wig. I love the color black for it matches my brows and lashes, very Natural looking!! I love this wigI love this wig have purchased it 3 times and would buy it again!! Get lots of complements when I wear it!!. It taken years off my look and it is very comfortable, light and flexible..
Love the looksThis has been a great buy. I have had many compliments, but it is not wearing as good as I thought it would and I am giving it excellent care. I had it professionally styled but now it is is thinning a lot considering it is less than a year old. I will have to rebuy and that is a lot of money for me. I still highly recommend it. PerfectI've been wearing Wigs for about four (4) years and I can honestly say this is the BEST ONE YET! Light easy to wear and it looks so REAL!!! This wig is my new favoriteI still love this wig. The cap is a very light weight so I am very comfortable wearing it. It does not look wiggy at all, and even people that wear a wig, compliment me on my hair not knowing it is a wig. YES it is a thinner wig, but really has just the right amount of hair and that is the very thing that makes it look so Natural. It has not frizzed at all. The hair is still very nice. I have a small head, and a petite size in this wig would probably fit perfect, but I don't have a problem with this one staying in place. I will keep wearing this wig for as long as they continue to make it. If they replace it, I hope it is with another one that is similar with the same amount of hair!!!!! Thank you Howigs for making such a nice quality wig.